In the days and weeks following the disaster, police fed false stories to the press suggesting that hooliganism and drunkenness by Liverpool supporters were the root causes of the disaster. Blaming of Liverpool fans persisted even after the Taylor Report of 1990, which found that the main cause of the disaster was a failure of control by South Yorkshire Police (SYP). Following the Taylor report, the Director of Public Prosecutions (DPP) ruled there was no evidence to justify prosecution of any individuals or institutions. The disaster also led to a number of safety improvements in the largest English football grounds, notably the elimination of fenced standing terraces in favour of all-seater stadiums in the top two tiers of English football. The first coroner's inquests into the Hillsborough disaster, completed in 1991, ruled all deaths that occurred that day to be accidental. Families strongly rejected the original coroner's findings, and their fight to have the matter re-opened persisted, despite Lord Justice Stuart-Smith concluding in 1997 there was no justification for a new inquiry. Private prosecutions brought by the Hillsborough Families Support Group against Duckenfield and his deputy Bernard Murray failed in 2000. In 2009, a Hillsborough Independent Panel was formed to review all evidence. Reporting in 2012, it confirmed Taylor's 1990 criticisms, while also revealing new details about the extent of police efforts to shift blame onto fans, the role of other emergency services, and the error of the first coroner's inquests. The panel's report resulted in the previous findings of accidental death being quashed, and the creation of new coroner's inquests. It also produced two criminal investigations led by police in 2012: Operation Resolve to look into the causes of the disaster, and by the Independent Police Complaints Commission (IPCC) to examine actions by police in the aftermath. The second coroner's inquests were held from 1 April 2014 to 26 April 2016. They ruled that the supporters were unlawfully killed due to grossly negligent failures by police and ambulance services to fulfil their duty of care to the supporters. The inquests also found that the design of the stadium contributed to the crush, and that supporters were not to blame for the dangerous conditions. Public anger over the actions of his force during the second inquests led the SYP chief constable David Crompton to be suspended following the verdict. In June 2017, six people were charged with various offences including manslaughter by gross negligence, misconduct in public office and perverting the course of justice for their actions during and after the disaster. The Crown Prosecution Service subsequently dropped all charges against one of the defendants. As is common at domestic matches in England, opposing supporters were segregated. Nottingham Forest supporters were allocated the South Stands and Spion Kop[a] on the east end, with a combined capacity of 29,800, reached by 60 turnstiles spaced along two sides of the ground. 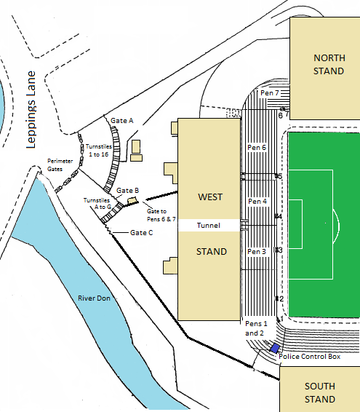 Liverpool supporters were allocated the North and West ends (Leppings Lane), holding 24,256 fans, reached by 23 turnstiles from a narrow concourse. Turnstiles numbered 1 to 10, 10 in all, provided access to 9,700 seats in the North Stand; a further 6 turnstiles (numbered 11 to 16) provided access to 4,456 seats in the upper tier of the West Stand. Finally, 7 turnstiles (lettered A to G) provided access to 10,100 standing places in the lower tier of the West Stand. Although Liverpool had more supporters, Nottingham Forest was allocated the larger area, to avoid the approach routes of rival fans crossing. As a result of the stadium layout and segregation policy, turnstiles that would normally have been used to enter the North Stand from the east were off-limits and all Liverpool supporters had to converge on a single entrance at Leppings Lane. On match day, radio and television advised fans without tickets not to attend. Rather than establishing crowd safety as the priority, clubs, local authorities and the police viewed their roles and responsibilities through the 'lens of hooliganism'. Three chartered trains transported Liverpool supporters to Sheffield for a match fixture[b] in 1988, but only one such train ran in 1989. The 350 passengers arrived on the grounds about 2:20 pm. Many supporters wished to enjoy the day and were in no hurry to enter the stadium too early. Some supporters were delayed by roadworks while crossing the Pennines on the M62 motorway which resulted in minor traffic congestion. Between 2:30 pm and 2:40 pm, there was a build-up of supporters outside the turnstiles facing Leppings Lane, eager to enter the stadium before the game began. At 2:46 pm, the BBC's football commentator John Motson had already noticed the imbalance of distribution of people in the Leppings Lane pens. While rehearsing for the match off-air, he suggested a nearby cameraman look as well. "There's gaps, you know, in parts of the ground. Well, if you look at the Liverpool end, to the right of the goal, there's hardly anybody on those steps...that's it. Look down there." Outside the stadium, a bottleneck developed with more fans arriving than could be safely filtered through the turnstiles before 3:00 pm. People presenting tickets at the wrong turnstiles and those who had been refused entry could not leave because of the crowd behind them but remained as an obstruction. Fans outside could hear cheering as the teams came on the pitch ten minutes before the match started, and as the match kicked off, but could not gain entrance. A police constable radioed control requesting that the game be delayed, as it had been two years before, to ensure the safe passage of supporters into the ground. The request to delay the start of the match by 20 minutes was declined. When the gates were opened, thousands of fans entered a narrow tunnel leading to the rear of the terrace into two overcrowded central pens (pens 3 and 4), creating pressure at the front. Hundreds of people were pressed against one another and the fencing by the weight of the crowd behind them. People entering were unaware of the problems at the fence; police or stewards usually stood at the entrance to the tunnel and, when the central pens reached capacity, directed fans to the side pens, but on this occasion, for reasons not fully explained, they did not. A BBC TV news report conjectured that if police had positioned two police horses correctly, they would have acted as breakwaters directing many fans into side pens, but on this occasion, it was not done. The match between Liverpool and Nottingham Forest began as scheduled at 3:00 pm. Fans were still streaming into pens 3 and 4 from the rear entrance tunnel as the match began. For some time, problems at the front of the Liverpool central goal pens went largely unnoticed except by those inside it, and by a few police at that end of the pitch. Liverpool's goalkeeper, Bruce Grobbelaar, reported fans from behind him pleading to him for help as the situation worsened. The police at first attempted to stop fans from spilling out of the pens, some believing this to be a pitch invasion. At approximately 3:05 pm in match action, Peter Beardsley kicked a shot which struck Nottingham Forest's goal bar. Possibly connected to the excitement, a surge in pen 3 caused one of its metal crush barriers to give way, thrusting people forward on top of one another, and into the pen's front fences. South Yorkshire Police Superintendent Greenwood (the ground commander) realised the situation, and ran on the field to gain referee Ray Lewis's attention. Lewis stopped the match at 3:05:30 as fans climbed the fence in an effort to escape the crush and went onto the track. By this time, a small gate in the fence had been forced open and some fans escaped via this route, as others continued to climb over the fencing. Other fans were pulled to safety by fans in the West Stand above the Leppings Lane terrace. The intensity of the crush broke more crush barriers on the terraces. Holes in the perimeter fencing were made by fans desperately attempting to rescue others. The crowd in the Leppings Lane Stand overspilled onto the pitch, where the many injured and traumatised fans who had climbed to safety congregated. Football players from both teams were ushered to their respective dressing rooms, and told that there would be a 30-minute postponement. Those still trapped in the pens were packed so tightly that many victims died of compressive asphyxia while standing. Meanwhile, on the pitch, police, stewards and members of the St John Ambulance service were overwhelmed. Many uninjured fans assisted the injured; several attempted CPR and others tore down advertising hoardings to use as stretchers. Chief Superintendent John Nesbit of South Yorkshire Police later briefed Michael Shersby MP that leaving the rescue to the fans was a deliberate strategy, and is quoted as saying "We let the fans help so that they would not take out their frustration on the police" at a Police Federation conference. As events unfolded, some police officers were still deployed making a cordon three-quarters of the way down the pitch to prevent Liverpool supporters reaching the opposing supporters. Without public address announcements to explain the situation, many Nottingham Forest fans on the other end were chanting for their team and whistled their anger at what they saw as a pitch invasion, incensing some of the Liverpool supporters. Some fans tried to break through the cordon simply to ferry injured fans to waiting ambulances on the Nottingham Forest end but were forcibly turned back. The adverse comments of two doctors regarding the emergency response appeared in the media. Their views were not "the maverick view from a disaffected minority but the considered opinion of the majority of professionals present from the outset". At Liverpool Metropolitan Cathedral, a requiem mass attended by 3,000 people was held by the Catholic Archbishop of Liverpool, Derek Worlock. The first reading was read by Liverpool goalkeeper Bruce Grobbelaar. Liverpool players Ronnie Whelan, Steve Nicol, and former manager Joe Fagan carried the communion bread and wine. David Sheppard, the Anglican Bishop of Liverpool, on holiday on the Scottish island of Barra on the day of the disaster, was airlifted by RAF helicopter to attend. By the disaster's 10th anniversary in 1999, at least three people who survived were known to have committed suicide. Another survivor had spent eight years in psychiatric care. There were cases of alcoholism, drug abuse, and collapsed marriages involving people who had witnessed the events. The lingering effects of the disaster were seen as a cause, or contributary factor, in all of these. A total of 96 people died as a result of injuries incurred during the disaster. Ninety-four persons, aged from 10 to 67 years old, died on the day, either at the stadium, in the ambulances, or shortly after arrival at hospital. A total of 766 people were reported to have suffered injuries, although less than half required hospital treatment. The less seriously injured survivors who did not live in the Sheffield area were advised to seek treatment for their injuries at hospitals nearer to their homes. On 19 April, the death toll reached 95 when 14-year-old Lee Nicol died in hospital after his life support machine was switched off. The death toll reached 96 in March 1993, when artificial feeding and hydration were withdrawn from 22-year-old Tony Bland after nearly four years, during which time he had remained in a persistent vegetative state showing no sign of improvement. This followed a legal challenge in the High Court by his family to have his treatment withdrawn, a landmark challenge which succeeded in November 1992. Andrew Devine, aged 22 at the time of the disaster, suffered similar injuries to Tony Bland and was also diagnosed as being in a persistent vegetative state. In March 1997—just before the eighth anniversary of the disaster—it was reported he had emerged from the condition and was able to communicate using a touch-sensitive pad, and he had been showing signs of awareness of his surroundings for up to three years before. He is still alive as of 2015[update]. Two sisters, three pairs of brothers, and a father and son were among those who died, as were two men about to become fathers for the first time: 25-year-old Steven Brown of Wrexham and 30-year-old Peter Thompson of Widnes. Jon-Paul Gilhooley, aged 10, was the youngest person to die. His cousin, Steven Gerrard, then aged 8, went on to become Liverpool F.C. 's captain. Gerrard has said the disaster inspired him to lead the team he supported as a boy and become a top professional football player. The oldest person to die at Hillsborough was 67-year-old Gerard Baron, an older brother of the already-deceased (in 1971) Liverpool player Kevin Baron. Stephen Whittle is considered by some to be the 97th victim of Hillsborough, as due to work commitments, he had sold his ticket to a friend (whom he and his family chose not to identify), who then died in the disaster; the resulting feeling of survivor guilt is believed to be the main reason for his suicide in February 2011. Of those who died, 78 were aged under 30, 38 of whom were under 20, and all but three of the victims were aged under 50. Inquests into the deaths were opened and adjourned immediately after the disaster. Resumed on 19 November 1990, they proved to be controversial. South Yorkshire coroner Dr Stefan Popper limited the main inquests to events up to 3:15 pm on the day of the disaster – nine minutes after the match was halted and the crowd spilled onto the pitch. Popper said this was because the victims were either dead, or brain dead, by 3:15 pm. The decision angered the families, many of whom felt the inquests were unable to consider the response of the police and other emergency services after that time. The inquests returned verdicts of accidental death on 26 March 1991, much to the dismay of the bereaved families, who had been hoping for a verdict of unlawful killing or an open verdict, and for manslaughter charges to be brought against the officers who had been present at the disaster. Trevor Hicks, whose two daughters had been killed, described the verdicts as 'lawful' but 'immoral'. Popper's decision regarding the cut-off time was subsequently endorsed by the Divisional Court who considered it to have been justified in the light of the medical evidence available to him. Relatives later failed to have the inquests reopened to allow more scrutiny of police actions and closer examination of the circumstances of individual cases. Families believed that Popper was 'too close' to the police. After the verdicts Barry Devonside, who had lost his son, witnessed Popper hosting a celebration party with police officers. Popper had excluded the witness evidence of two qualified Merseyside doctors (Drs Ashton and Phillips) who had been inside the stadium on the day and who had been critical of the chaotic emergency response. The views of both were dismissed by the Taylor report. They both gave evidence at the 2016 Warrington inquests. Phillips, stated that the exclusion of their evidence was a 'serious error of judgement' by Popper. He expressed that he 'could not fathom why he didn't call us, other than he specifically did not want to hear our evidence, in which case the first inquests were coloured and flawed before they even started'. Ashton and Phillips were not the only doctors present at the disaster not to be called to give evidence to the Popper inquests. The only one called was the Sheffield Wednesday club doctor. After the disaster, Lord Justice Taylor was appointed to conduct an inquiry into the events. The Taylor Inquiry sat for a total of 31 days (between 15 May and 29 June 1989) and published two reports: an interim report (1 August 1989) which laid out the events of the day and immediate conclusions, and the final report (19 January 1990) which outlined general recommendations on football ground safety. This became known as the Taylor Report. Taylor concluded that policing on the day "broke down" and "the main reason for the disaster was the failure of police control". Attention was focused on the decision to open the secondary gates; moreover, the kick-off should have been delayed, as had been done at other venues and matches. Sheffield Wednesday was also criticised for the inadequate number of turnstiles at the Leppings Lane end and the poor quality of the crush barriers on the terraces, "respects in which failure by the Club contributed to this disaster". Taylor found there was "no provision" for controlling the entry of spectators into the turnstile area. He dismissed the claim by senior police officers that they had no reason to anticipate problems, since congestion had occurred at both the 1987 and 1988 semi-finals. He said that "the Operational Order and police tactics on the day failed to provide for controlling a concentrated arrival of large numbers should that occur in a short period. That it might so occur was foreseeable". The failure by the police to give the order to direct fans to empty areas of the stadium, was described by Taylor as "a blunder of the first magnitude". There was no means for calculating when individual enclosures had reached capacity. A police officer ordinarily made a visual assessment before guiding fans to other pens. However, on the day of the disaster, "by 2.52 pm when gate C was opened, pens 3 and 4 were over-full [...] to allow any more into those pens was likely to cause injuries; to allow in a large stream was courting disaster". The report noted that the official capacity of the central pens was 2,200, that the Health and Safety Executive found this should have been reduced to 1,693 due to crush barriers and perimeter gates, but actually an estimated 3,000 people were in the pens around 3:00 pm. The report said "When spectators first appeared on the track, the immediate assumption in the control room was that a pitch invasion was threatened. This was unlikely at the beginning of a match. It became still less likely when those on the track made no move towards the pitch. ... [T]here was no effective leadership either from control or on the pitch to harness and organise rescue efforts. No orders were given for officers to enter the tunnel and relieve pressure". Further that: "The anxiety to protect the sanctity of the pitch has caused insufficient attention to be paid to the risk of a crush due to overcrowding". Lord Taylor regarded spectator allocation as irrelevant to the disaster. "I do not consider choice of ends was causative of the disaster. Had it been reversed, the disaster could well have occurred in a similar manner but to Nottingham supporters". Lord Taylor concluded that the behaviour of Liverpool fans, including accusations of drunkenness, were secondary factors, and said that most fans were: "not drunk, nor even the worse for drink". He concluded that this formed an exacerbating factor but that police, seeking to rationalise their loss of control, overestimated the element of drunkenness in the crowd. The report dismissed the theory, put forward by South Yorkshire Police, that fans attempting to gain entry without tickets or with forged tickets were contributing factors. Taylor concluded that in responding to the disaster there had been no fault on the part of the emergency services (St Johns Ambulance, South Yorkshire Metropolitan Ambulance Service and fire brigade). Taylor concluded his criticism of South Yorkshire Police by describing senior officers in command as "defensive and evasive witnesses" who refused to accept any responsibility for error: "In all some 65 police officers gave oral evidence at the Inquiry. Sadly I must report that for the most part the quality of their evidence was in inverse proportion to their rank". Further stating: "South Yorkshire Police were not prepared to concede they were in any respect at fault in what occurred. ... [T]he police case was to blame the fans for being late and drunk, and to blame the Club for failing to monitor the pens. ... Such an unrealistic approach gives cause for anxiety as to whether lessons have been learnt". In July 1992, the government announced a relaxation of the regulation for the lower two English leagues (known now as League One and League Two). The Football Spectators Act does not cover Scotland, but the Scottish Premier League chose to make all-seater stadiums a requirement of league membership. In England and Wales all-seating is a requirement of the Premier League and of the Football League for clubs who have been present in the Championship for more than three seasons. Several campaigns have attempted to get the government to relax the regulation and allow standing areas to return to Premiership and Championship grounds. The Hillsborough Independent Panel was instituted in 2009 by the British government to investigate the Hillsborough disaster, to oversee the disclosure of documents about the disaster and its aftermath and to produce a report. On 12 September 2012, it published its report and simultaneously launched a website containing 450,000 pages of material collated from 85 organisations and individuals over two years. In the years after the disaster, the Hillsborough Family Support Group, had campaigned for the release of all relevant documents into the public domain. After the disaster's 20th anniversary in April 2009, supported by the Culture secretary, Andy Burnham, and Minister of State for Justice, Maria Eagle, the government asked the Home Office and Department of Culture, Media and Sport to investigate the best way for this information to be made public. In April 2009, the Home Secretary Jacqui Smith announced she had requested secret files concerning the disaster be made public. In December 2009, Home Secretary Alan Johnson said the Hillsborough Independent Panel's remit would be to oversee "full public disclosure of relevant government and local information within the limited constraints set out in the disclosure protocol" and "consult with the Hillsborough families to ensure that the views of those most affected by the disaster are taken into account". An archive of all relevant documentation would be created and a report produced within two years explaining the work of the panel and its conclusions. The panel noted that, despite being dismissed by the Taylor Report, the idea that alcohol contributed to the disaster proved remarkably durable. Documents disclosed confirm that repeated attempts were made to find supporting evidence for alcohol being a factor, and that available evidence was significantly misinterpreted. It noted "The weight placed on alcohol in the face of objective evidence of a pattern of consumption modest for a leisure event was inappropriate. It has since fuelled persistent and unsustainable assertions about drunken fan behaviour". The evidence it released online, included altered police reports. On the day after the verdicts were reached the Home Secretary, Theresa May, made a statement to Parliament which included the verdicts of the jury to the fourteen questions they had been asked regarding the roles of South Yorkshire police, the South Yorkshire Metropolitan Ambulance Service, Sheffield Wednesday football club and Hillsborough stadium's engineers and two specific questions specific relating to the time and cause of death for each of the dead. In addition to the "unlawful killing" verdict, the jury concluded that "errors or omissions" by police commanding officers, Sheffield Wednesday, the ambulance service and the design and certification of the stadium had all "caused or contributed" to the deaths, but that the behaviour of football supporters had not. In all but one case, the jury recorded the time of death as later than the 3.15 pm cut-off point adopted by the coroner at the original inquests. Echoing his 2012 expression of regret  former Home Secretary Jack Straw apologised to the families for the failures of his 1997 review of the disaster. Kelvin MacKenzie, who wrote the now-infamous "The Truth" front page for the Sun, said that although he was "duped" into publishing his story, that his "heart goes out" to the families of those affected, saying that "It's quite clear today the fans had nothing to do with it". However, MacKenzie did not accept any personal responsibility for the story. During the inquests, Maxwell Groome – a police constable at the time of the disaster – made allegations of a high-level "conspiracy" by Freemasons to shift blame for the disaster onto Superintendent Roger Marshall, also that junior officers were pressured into changing their statements after the disaster, and told not to write their accounts in their official police pocketbooks. Groome also claimed that match commander Duckenfield was a member of the "highly influential" Dole lodge in Sheffield (the same lodge as Brian Mole, his predecessor.) Coroner Sir John Goldring warned the jury that there was "not a shred of evidence" that any Masonic meeting actually took place, or that those named were all Freemasons, advising the jury to cast aside "gossip and hearsay". During the inquests, Duckenfield confirmed that he became a Freemason in 1975 and became Worshipful Master of his local lodge in 1990, a year after the disaster; following this revelation, Freemasons were forbidden to take part in the IPCC investigation and Operation Resolve as civilian investigators to prevent any perceived bias. Following the inquests verdicts, South Yorkshire police announced it would refer the actions of its officers to the Independent Police Complaints Commission (IPCC). West Yorkshire Police announced it would refer its Chief Constable, Norman Bettison, to the IPCC in mid-September. Bettison had been one of a number of police officers who were accused of manipulating evidence by the Hillsborough Independent Panel. In early October, Bettison announced his retirement, becoming the first senior figure to step down since publication of the panel's report. The IPCC announced on 12 October 2012 that it would investigate the failure of the police to declare a major incident, failure to close the tunnel to the stands which led to overcrowded pens despite evidence it had been closed in such circumstances in the past; changes made to the statements of police officers; actions which misled Parliament and the media; shortcomings of previous investigations; and the role played by Norman Bettison. By 22 October 2012, the names of at least 1,444 serving and former police officers had been referred to the IPCC investigation. In its announcement, the IPCC praised the tenacity of the Hillsborough families' campaign for truth and justice. On 16 October 2012, the Attorney General announced in Parliament he had applied to have the original inquests verdicts quashed, arguing it proceeded on a false basis and evidence now to hand required this exceptional step. On 12 July 2013, it was reported that the IPCC had found that in addition to the now 164 police statements known to have been altered, a further 55 police officers had changed their statements. Deborah Glass, deputy chair of the IPCC said, "We know the people who have contacted us are the tip of the iceberg." That was after the IPCC's Hillsborough Contact team had received 230 pieces of correspondence since October 2012. The IPCC is also investigating the actions of West Midlands Police, who in 1989 had been tasked with investigating South Yorkshire Police's conduct for both the original inquests and also the Taylor independent inquiry. In April 2016, the Crown Prosecution Service announced that it would consider bringing charges against both individuals and corporate bodies once the criminal investigation by the Independent Police Complaints Commission – Operation Resolve – had been completed. Commissioned by the Home Secretary Theresa May, a report was published on 1 November 2017 by the Right Reverend James Jones titled The patronising disposition of unaccountable power : A report to ensure that the pain and suffering of the Hillsborough families is not repeated. In February 2000, a private prosecution was brought against Chief Superintendent David Duckenfield and another officer, Bernard Murray. The prosecution argued that the crush was "foreseeable" hence the defendants were "grossly negligent". Prosecutor Alun Jones told the court that Duckenfield gave the order to open the gates so that hundreds of fans could be herded on to the already crowded terraces at the stadium. Jones stated that minutes after the disaster, Duckenfield "deceitfully and dishonestly" told senior FA officials that the supporters had forced the gate open. Duckenfield admitted he had lied in certain statements regarding the causes of the disaster. The prosecution ended on 24 July 2000, when Murray was acquitted and the jury was unable to reach a verdict in the case of Duckenfield. On 26 July 2000, the judge refused the prosecution's application for a re-trial of Duckenfield. Police disciplinary charges were abandoned when Duckenfield retired on health grounds and, because he was unavailable, it was decided it would be unfair to proceed with disciplinary charges against Bernard Murray. Duckenfield took medical retirement on a full police pension. Home Secretary Theresa May announced on 18 December 2012 that a new police enquiry would be initiated to examine the possibility of charging agencies other than the police over the Hillsborough deaths. The enquiry was headed by former Durham Chief Constable Jon Stoddart. Now it is headed by Assistant Commissioner Rob Beckley. On 28 June 2017, it was announced that six people were to be charged with offences in relation to the disaster. Former Chief Superintendent David Duckenfield, in charge of the match, faces 95 counts of manslaughter by gross negligence. He faces no charge in respect of the death of Tony Bland, who died four years after the disaster. Former Chief Inspector Sir Norman Bettinson faces four counts of misconduct in public office. Former Sheffield Wednesday F.C. Club Secretary Graham Mackrell faces a charge of breaching the Safety at Sports Ground Act 1975. Solicitor Peter Metcalf, former Chief Superintendent Donald Denton and former Detective Chief Inspector Alan Foster were all charged with perverting the course of justice. On 9 August, all except Duckenfield appeared at Warrington Magistrates Court. Mackrell pleaded not guilty to the charge against him. No formal pleas were taken from the other four defendants. All five were bailed to appear at the Crown Court on 6 September. Duckenfield was not required to appear as the Crown Prosecution Service (CPS) needed to apply to the High Court to lift a court order before he can be prosecuted on the manslaughter charges. On 29 June 2018, a ruling was made that Duckenfield would be prosecuted on the manslaughter charges. In December 2017, it was announced that a police officer and a farrier would not be prosecuted over allegations that they fabricated a story about a police horse being burned with cigarettes at Hillsborough. Although there was enough evidence to charge the farrier with perverting the course of justice, it was felt not to be in the public interest to charge him. There was insufficient evidence against the police officer to charge him with the offence. On 21 August 2018, it was announced that all charges against Bettison were being dropped as the CPS felt that there was insufficient evidence to have a realistic chance of a conviction. The death of two witnesses and contradictions in the evidence of others was cited as part of the reason for the decision. Representatives of the 96 victims of the disaster stated that they would be asking for an independent review of the decision under the Right to Review Scheme. On 10 September 2018, at a trial preparation hearing at Preston Crown Court, Duckenfield pleaded not guilty to all 95 charges against him. Mackrell pleaded not guilty to the two charges against him. A provisional trial date of 14 January 2019 was set. The trial started on 14 January 2019 at Preston Crown Court, Lancashire before Mr Justice Openshaw. It is expected to last for three or four months. On 13 March, it was reported that Duckenfield would not be called to give evidence in his defence. It was also reported that the jury would be directed to find Mackrell not guilty on the charge of contravening the stadium's safety certificate due to a lack of evidence. On 3 April, the jury returned with a guilty verdict against Mackrell on a health and safety charge and was unable to reach a verdict on Duckenfield. In April 2016, a private prosecution was launched on behalf of victims' relatives against both SYP and the West Midlands Police force (who had investigated the actions of SYP), alleging a concerted cover-up designed to shift blame away from the police. Several memorials have been erected in memory of the victims of the Hillsborough disaster. A memorial at Hillsborough stadium, unveiled on the tenth anniversary of the disaster on 15 April 1999, reads: "In memory of the 96 men, women, and children who tragically died and the countless people whose lives were changed forever. FA Cup semi-final Liverpool v Nottingham Forest. 15 April 1989. 'You'll never walk alone.'" A memorial plaque dedicated to the 96 at Goodison Park in Liverpool, home of local rivals Everton F.C..
From 2007, there was a Hillsborough Memorial service held at Spion Kop, KwaZulu-Natal, South Africa annually. The ceremony is held on the Spion Kop Battlefield which gave its name to the Kop Stand at Anfield. There is a permanent memorial to the 96 fans who died, in the form of a bench in view of the battlefield at a nearby lodge. Dean Davis and David Walters, South African Liverpool supporters, are responsible for the service and the bench was commissioned by Guy Prowse in 2008. Following on from, and out of respect for the Hillsborough families decision to conclude official memorials at Anfield as of 2016[update]; there will be no further Memorials held at Spion Kop. 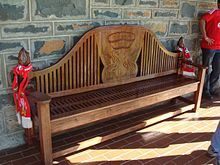 The Memorial bench remains at Spion Kop Lodge. In 2014, the FA decided all FA Cup, Premier League, Football League and Football Conference matches played between 11–14 April, would kick-off seven minutes later than originally scheduled with a six-minute delay and a one-minute silence tribute. In 1999, Anfield was packed with a crowd of around 10,000 people ten years after the disaster. A candle was lit for each of the 96 victims. The clock at the Kop End stood still at 3:06 pm, the time that the referee had blown his whistle in 1989 and a minute's silence was held, the start signalled by match referee from that day, Ray Lewis. A service led by the Right Reverend James Jones, the Bishop of Liverpool, was attended by past and present Liverpool players, including Robbie Fowler, Steve McManaman and Alan Hansen. According to the BBC report: "The names of the victims were read from the memorial book and floral tributes were laid at a plaque bearing their names." A gospel choir performed and the ceremony ended with a rendition of "You'll Never Walk Alone". The anniversary was also marked by a minute's silence at the weekend's league games and FA Cup semi-finals. On 11 April 2009, Liverpool fans sang "You'll Never Walk Alone" as a tribute to the upcoming anniversary of the disaster before the home game against Blackburn Rovers (which ended in Liverpool winning 4–0) and was followed by former Liverpool player, Stephen Warnock presenting a memorial wreath to the Kop showing the figure 96 in red flowers. On 30 April 1989, a match organised by Celtic F.C. was played at Celtic Park, Glasgow between the home club and Liverpool, the proceeds going to the Hillsborough fund. Liverpool won the match by four goals to nil. As a result of the disaster, Liverpool's scheduled fixture against Arsenal[b] was delayed from 23 April until the end of the season and eventually decided the league title. At this fixture, Arsenal players brought flowers onto the pitch and presented them to the Liverpool fans around the stadium before the game commenced. During a 2011 debate in the House of Commons, the Labour MP for Liverpool Walton, Steve Rotheram, read out a list of the victims and, as a result, the names were entered into Hansard. Initial media coverage – spurred by what Phil Scraton calls in Hillsborough: The Truth "the Heysel factor" and "hooligan hysteria" – began to shift the blame onto the behaviour of the Liverpool fans at the stadium, making it a public order issue. 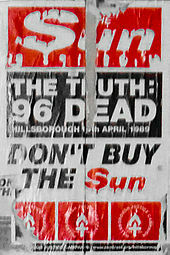 As well as The Sun's 19 April 1989 "The Truth" article (see below) other newspapers published similar allegations; the Daily Star headline on the same day reported "Dead fans robbed by drunk thugs"; the Daily Mail accused the Liverpool fans of being "drunk and violent and their actions were vile", and The Daily Express ran a story alleging that "Police saw 'sick spectacle of pilfering from the dying'." Peter McKay in the Evening Standard wrote that the "catastrophe was caused first and foremost by violent enthusiasm for soccer and in this case the tribal passions of Liverpool supporters [who] literally killed themselves and others to be at the game" and published a front-page headline "Police attack 'vile' fans" on 18 April 1989, in which police sources blamed the behaviour of a section of Liverpool fans for the disaster. In Liverpool local journalist John Williams of the Liverpool Daily Post wrote in an article titled "I Blame the Yobs" that "The gatecrashers wreaked their fatal havoc ... Their uncontrolled fanaticism and mass hysteria ... literally squeezed the life out of men, women and children ... yobbism at its most base ... Scouse killed Scouse for no better reason than 22 men were kicking a ball". In other regional newspapers, the Manchester Evening News wrote that the "Anfield Army charged on to the terrace behind the goal – many without tickets", and the Yorkshire Post wrote that the "trampling crush" had been started by "thousands of fans" who were "latecomers ... forc[ing] their way into the ground". The Sheffield Star published similar allegations to The Sun, running the headline "Fans in Drunken Attacks on Police". Many of the more serious allegations – such as stealing from the dead and assault of police officers and rescue workers – appeared on 18 April, although several evening newspapers published on 15 April 1989 also gave inaccurate reporting of the disaster, as these newspapers went to press before the full extent or circumstances of the disaster had been confirmed or even reported. This included the Wolverhampton-based Express & Star, which reported that the match had been cancelled as a result of a "pitch invasion in which many fans were injured". This article was presumably published before there were any reports that people had been killed. These media reports and others were examined during the 2012 Hillsborough Independent Panel report. 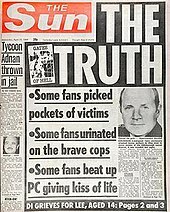 On 19 April, four days after the disaster, Kelvin MacKenzie, editor of The Sun, ordered "The Truth" as the front-page headline, followed by three sub-headlines: "Some fans picked pockets of victims", "Some fans urinated on the brave cops" and "Some fans beat up PC giving kiss of life". Mackenzie reportedly spent two hours deciding on which headline to run; his original instinct being for "You Scum" before eventually deciding on "The Truth". The information was provided to the newspaper by Whites News Agency in Sheffield; the newspaper cited claims by police inspector Gordon Sykes, that Liverpool fans had pickpocketed the dead, as well as other claims by unnamed police officers and local Conservative MP Irvine Patnick. The Daily Express also carried Patnick's version, under the headline "Police Accuse Drunken Fans" which gave Patnick's views, saying he had told Margaret Thatcher, while escorting her on a tour of the ground after the disaster, of the "mayhem caused by drunks" and that policemen told him they were "hampered, harassed, punched and kicked". The story accompanying The Sun headlines claimed "drunken Liverpool fans viciously attacked rescue workers as they tried to revive victims" and "police officers, firemen and ambulance crew were punched, kicked and urinated upon". A quotation, attributed to an unnamed policeman, claimed a partially unclothed dead girl had been verbally abused, and that Liverpool fans were "openly urinating on us and the bodies of the dead". In fact many Liverpool fans helped security personnel stretcher away victims and gave first aid to the injured. The Guardian later wrote that "The claim that supporters higher up the Leppings Lane terrace had urinated on police pulling bodies out of the crush appeared to have roots in the fact that those who were dying or sustaining serious injuries suffered compression asphyxia and many involuntarily urinated, vomited and emptied their bowels as they were crushed." After The Sun's report, the newspaper was boycotted by most newsagents in Liverpool and many readers cancelled their orders and refused to buy it from newsagents; and from then afterwards many in Liverpool refer to The Sun newspaper as The Scum. Some even refuse to say the name or spell it as The S*n. The Hillsborough Justice Campaign organised a less successful national boycott that had some impact on the paper's sales nationally. MacKenzie explained his actions in 1993. Talking to a House of Commons National Heritage Select Committee, he said: "I regret Hillsborough. It was a fundamental mistake. The mistake was I believed what an MP said. It was a Tory MP. If he had not said it and the Chief Superintendent had not agreed with it, we would not have gone with it." MacKenzie retracted the apology in November 2006, saying he apologised because the newspaper's owner, Rupert Murdoch, had ordered him to do so, stating: "I was not sorry then and I'm not sorry now". MacKenzie refused to apologise when appearing on the BBC's topical Question Time on 11 January 2007. The Sun apologised for its treatment of the Hillsborough disaster "without reservation" in a full page opinion piece on 7 July 2004, saying it had "committed the most terrible mistake in its history" by publishing it. The apology angered some Liverpudlians further. The Liverpool Echo called the apology, "shabby" and "an attempt, once again, to exploit the Hillsborough dead". In response, Trevor Hicks, chairman of the Hillsborough Family Support Group, rejected MacKenzie's apology as "too little, too late", calling him "lowlife, clever lowlife, but lowlife". A press conference held by families of the victims also banned all Sun reporters from entering, with a sign on the door reading "NO ENTRY TO SUN JOURNALISTS". Sales of The Sun remain poor in Merseyside and a boycott is still practised. In 2004, its average circulation in Liverpool was 12,000 copies a day. Following the April 2016 verdict of unlawful killing, The Sun and the first print edition of the Times (both owned by News International), did not cover the stories on their front pages, with The Sun relegating the story to pages 8 and 9. An apology appeared on page 10, reiterating previous statements that the 1989 headline had been an error of judgement. The coverage was widely condemned on social media, with Twitter users saying that this reflected "Murdoch's view on Hillsborough", which was a "smear", which "now daren't speak its name". On the night of the verdict coverage, more than 124,000 tweets used the term The Sun. In February 2017, Liverpool F.C. issued a ban on The Sun journalists from entering their grounds in response to the coverage of Hillsborough by the newspaper. Everton F.C. followed in April 2017 on the eve of the 28th anniversary of the disaster after a column by Kelvin MacKenzie concerning Everton footballer Ross Barkley. MacKenzie was suspended as a contributor to the newspaper. The November 2002 edition of the men's lifestyle magazine FHM in Australia was swiftly withdrawn from sale soon after its publication, and a public apology made in the Australian and British editions, because it contained jokes mocking the disaster. As a result, Emap Australia, who owned FHM at the time, pledged to make a donation to the families of the victims. Although the original apology was not printed in the magazine as it was not considered "serious enough", its Australian editor, Geoff Campbell, released a statement: "We deeply regret the photograph captions published in the November issue of the Australian edition of FHM, accompanying an article about the Hillsborough disaster of 1989. The right course of action is to withdraw this edition from sale – which we will be doing. We have been in contact with the Hillsborough Family Support Group and the Hillsborough Justice Campaign to express our deep regret and sincere apologies." The British edition disassociated itself from the controversy, stating: "FHM Australia has its own editorial team and these captions were written and published without consultation with the UK edition, or any other edition of FHM." The Spectator's comments were widely circulated following the April 2016 verdict by the Hillsborough inquest's second hearing proving unlawful killing of the 96 dead at Hillsborough. Liverpool goalkeeper Charles Itandje was accused of having shown disrespect towards the Hillsborough victims during the 2009 remembrance ceremony, as he was spotted on camera "smiling and nudging" teammate Damien Plessis. He was suspended from the club for a fortnight and many fans felt he should not play for the club again. He was omitted from the first team squad and never played for the club in any capacity again. On 28 June 2010, following England's departure from the 2010 FIFA World Cup competition in South Africa, the UK's Culture and Sport Secretary Jeremy Hunt praised the England fans for their behaviour during the competition, saying "I mean, not a single arrest for a football-related offence, and the terrible problems that we had in Heysel and Hillsborough in the 1980s seem now to be behind us." He later apologised and said "I know that fan unrest played no part in the terrible events of April 1989 and I apologise to Liverpool fans and the families of those killed and injured in the Hillsborough disaster if my comments caused any offence." Margaret Aspinall, chairperson of the Hillsborough Family Support Group, asked for a face to face meeting with Hunt before deciding if she would accept the apology. 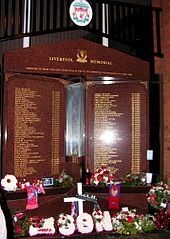 Fans of rival football clubs such as Manchester United have been known to mention the Hillsborough disaster at fixtures[b] to upset Liverpool fans. Following the findings of the Independent Panel in September 2012, Alex Ferguson and two Manchester United fan groups called for an end to the "sick chants". Leeds United chairman Ken Bates endorsed this call in the club programme and stated, "Leeds have suffered at times with reference to Galatasaray; some of our so-called fans have also been guilty as well, particularly in relation to Munich." This is a reference to the deaths of eight Manchester United players in the Munich air disaster of 1958. Popplewell was criticised for the comments, including a rebuke from a survivor of the Bradford fire. Labour MP Steve Rotheram, commented: "How insensitive does somebody have to be to write that load of drivel?" In March 2016, Crompton announced that he would retire in November. On 26 April 2016, after the inquest jury delivered a verdict affirming all the charges against the police, Crompton "unequivocally accepted" the verdicts, including unlawful killing, said that the police operation at the stadium on the day of the disaster had been "catastrophically wrong", and apologised unreservedly. Following continued criticism of Crompton in the wake of the unlawful killing verdict, South Yorkshire Police and Crime Commissioner Alan Billings suspended Crompton from duty on 27 April. In 2009, nearly twenty years to the day after the disaster, Steven Cohen, a presenter on Fox Soccer Channel and Sirius satellite radio in the United States (an Englishman and Chelsea fan), stated on his radio show that Liverpool fans "without tickets" were the "root cause" and "perpetrators" of the disaster. A boycott of advertisers by American Liverpool fans eventually brought about an apology from him. Despite this he was replaced as presenter of Fox Football Fone-in. His actions were disowned by Chelsea Football Club and he no longer works as a broadcaster. In 1996, Sir Bernard Ingham, former press secretary to former Prime Minister Margaret Thatcher, caused controversy with his comments about the disaster. In a letter addressed to a victim's parent, Ingham wrote that the disaster was caused by "tanked up yobs". In another letter written to a Liverpool supporter, also written in 1996, Ingham remarked that people should "shut up about Hillsborough". On the day of the inquest verdict, Ingham refused to apologise or respond to the previous comments he made, telling a reporter, "I have nothing to say." There have since been calls to have Ingham stripped of his knighthood. In March 2018, British clothing retailer Topman marketed a T-shirt which was interpreted by members of the public, including relatives of Hillsborough victims, as mocking the disaster. The T-shirt was red with white details like a Liverpool shirt, and had the number 96 on the back like a football shirt, with the text "Karma" and "What goes around comes back around", and a white rose, as associated with Yorkshire. Topman stated that the T-shirt was in reference to a Bob Marley song re-released in 1996 and apologised and withdrew the item. On 20 May 1989, a week after the disaster, Channel 4's After Dark programme broadcast a live discussion Football – The Final Whistle? Bereaved parent Eileen Delaney was a guest, along with her husband James. Extracts from what she said can be read here and in Hillsborough – The Truth by Phil Scraton (Mainstream Publishing 2016). A television drama film, based on the disaster and subsequent events, titled simply Hillsborough, was produced by Granada Television. It was highly praised and won the BAFTA Award for Best Single Drama in 1997. Christopher Eccleston, Ricky Tomlinson and Mark Womack were among the cast of the film. It was aired for the first time in 1996, and has been aired four times since then, in 1998, 2009, in September 2012 on the weekend following the release of the findings of the Hillsborough Independent Panel, and again on 1 May 2016 on ITV. In 2009 BBC Radio 4 transmitted "The Reunion": on the 20th anniversary Sue MacGregor brought together a group of people who were involved in the disaster to talk about the events of that day at a time when they were still in the midst of their fight for justice. This programme was repeated at the end of the week in which the Hillsborough inquest found that the 96 Liverpool football died unlawfully. The programme can be heard here. The American sports network ESPN, as part of its 30 for 30 series of sports films (under a new "Soccer Stories" subdivision), aired the documentary Hillsborough as a co-production with the BBC. Directed by Daniel Gordon, the 2-hour film chronicles the disaster, the investigations, and their lingering effects; it also included interviews with survivors, victims' relatives, police officers and investigators. Hillsborough aired the first time on 15 April 2014, the 25th anniversary of the disaster. The documentary was unable to be shown in Great Britain upon initial release due to the 2012 High Court inquest still being in progress. The documentary includes previously unreleased security camera footage from the stadium on the day of the disaster. After the inquest verdict the BBC aired the documentary on 8 May 2016, with additional footage from the inquest, as well as its final verdict. ^ Several British stadiums have a stand called "Spion Kop" or "The Kop". The name, originally that of a hill in South Africa, usually refers to an unusually steep stand. ^ "1989: Football fans crushed at Hillsborough". BBC. 15 April 1989. Retrieved 10 May 2016. ^ a b Turner, Richard. "Five Hillsborough myths dispelled by inquests jury". BBC News. Retrieved 10 May 2016. ^ a b c d e f g h i "Hillsborough Disaster: From tragedy to truth". BBC News. Retrieved 10 May 2016. ^ "The legacy of Hillsborough – how football has changed". The Telegraph. Retrieved 10 May 2016. ^ Gibson, Owen (12 April 2009). "Out of the ashes of Hillsborough, modern football was born, writes Owen Gibson". The Guardian. Retrieved 10 May 2016. ^ Gibson, Owen (19 December 2012). "High court quashes Hillsborough inquest verdicts". The Guardian. ISSN 0261-3077. Retrieved 7 August 2016. ^ a b Conn, David (17 April 2009). "Football: David Conn on Hillsborough". The Guardian. Retrieved 12 September 2012. ^ "Hillsborough papers: Cameron apology over 'double injustice'". BBC News. Retrieved 10 May 2016. ^ Gibson, Owen; Conn, David; Siddique, Haroon (12 September 2012). "Hillsborough disaster: David Cameron apologises for 'double injustice'". The Guardian. London. Retrieved 12 September 2012. ^ "Independent Police Complaints Commission". ipcc.gov.uk. Retrieved 10 May 2016. ^ a b Conn, David (26 April 2016). "Hillsborough inquests jury rules 96 victims were unlawfully killed". The Guardian. London. Retrieved 26 April 2016. ^ Dodd, Vikram; Stewart, Heather (27 April 2016). "South Yorkshire police chief suspended after Hillsborough verdict". The Guardian. London. Retrieved 28 April 2016. ^ "Five Hillsborough Myths Dispelled by Inquests Jury". BBC News. 28 April 2016. Retrieved 8 March 2017. ^ Lacey, David (15 April 1999). "Before Hillsborough fans were seen as terrace fodder. Now they are customers to be wooed and cosseted". The Guardian. UK. Retrieved 1 August 2007. ^ "Deaths and Injuries at Major Accidents at British Football Stadiums". Football Licensing Authority. Archived from the original on 18 April 2009. Retrieved 11 July 2007. ^ Taylor, Daniel (15 September 2012). "How Bradford fire neglect left Hillsborough doomed to disaster". The Guardian Sports Blog. Retrieved 15 September 2012. ^ Cmd 9710: Committee of Inquiry into Crowd Safety at Sports Grounds Final Report. The Stationery Office, London. 1986. p. 62. ^ Taylor (1989), p. 21. ^ Statement of Witness. Assistant Chief Constable Robert Goslin 14 August 1990. ^ Conn, David (19 September 2012). "Safety failings that contributed to death of 96 Liverpool fans were foreseeable". The Guardian. Retrieved 22 September 2012. ^ "Sheffield licensing officer from time of Hillsborough disaster still works for council". Sheffield Star. Retrieved 22 September 2012. ^ Carpente, Steve (19 September 2012). "Sky Blues fans recall Hillsborough choas". Coventry Observer. Archived from the original on 14 October 2012. Retrieved 22 September 2012. ^ a b Bates, Matthew (12 September 2012). "Hillsborough warning signs were there in 1987". Coventry Observer. Archived from the original on 15 September 2012. Retrieved 15 September 2012. ^ Ross, Sam (13 September 2012). "David Bernstein makes unreserved apology for Hillsborough disaster". Metro. Archived from the original on 16 September 2012. ^ a b Hillsborough Independent Panel. "Witness statement of Chief Superintendent Brian Mole, South Yorkshire Police" (PDF). ^ a b Conn, David (7 July 2014). "Hillsborough inquest hears of police commander's transfer before match". The Guardian. ISSN 0261-3077. Retrieved 6 August 2016. ^ Conn, David (30 June 2014). "Hillsborough police officer in command 'had little training' for 1989 FA Cup". The Guardian. ISSN 0261-3077. Retrieved 6 August 2016. ^ Conn, David (26 April 2016). "Hillsborough: anatomy of a disaster". The Guardian. ^ Scraton, P., 2004. 4 Death on the Terraces: The Contexts and Injustices of the 1989 Hillsborough Disaster. Soccer & Society, 5(2), pp.183–200. ^ Taylor (1989), p. 9. ^ a b Taylor (1989), p. 34. ^ a b "BBC Panorama 2013: Hillsborough Disaster. How They Buried the Truth". YouTube. Retrieved 12 August 2016. ^ a b c "Bruce Grobbelaar: I heard the crowd at Hillsborough cry 'Please help us..'". Liverpool Echo. 6 April 2009. Retrieved 13 July 2016. ^ Taylor (1989), p. 11. ^ Taylor (1989), p. 12. ^ Conn, David (13 February 2019). "Senior police officer did not step in, Hillsborough trial hears". The Guardian. Retrieved 13 February 2019. ^ a b c d e "How the Hillsborough disaster happened". BBC News. 14 April 2009. ^ "Timeline to disaster". BBC. Retrieved 14 August 2016. ^ a b c d e f g h i Hillsborough Independent Panel (20 September 2012). "Part 2, Chapter 4: Emergency Response and Aftermath". The Report of the Hillsborough Independent Panel (PDF) (Report). The Stationery Office Ltd. / Controller of Her Majesty's Stationery Office. pp. 131–157. ISBN 9780102980356. ^ ESPN Staff (20 May 2013). "Key Hillsborough Evidence Backed By TV Footage". ESPN.co.uk. ESPN Sports Media Ltd. Retrieved 5 July 2017. ^ Barlow, Eleanor (3 February 2015). "Ambulanceman's Struggle to Live with Decisions Made on Pitch at Hillsborough". Liverpool Echo. Trinity Mirror Merseyside. Retrieved 5 July 2017. ^ Smith, Hayden (20 May 2013). "Hillsborough: New Probe Backs Crucial Evidence". Metro. Associated Newspapers Limited. Retrieved 5 July 2017. ^ Weston, Alan (29 January 2015). "Ambulances Got 'Stuck' As They Tried to Enter Hillsborough Stadium, Inquests Hear". Liverpool Echo. Trinity Mirror Merseyside. Retrieved 5 July 2017. ^ a b c McCallum, Andrew (17 April 1989). "Grieving fans pay tribute at the Kop". Glasgow Herald. p. 20. ^ a b c "Police to face inquiry as questions go unanaswered". Glasgow Herald. Glasgow. 19 April 1989. p. 1"." ^ a b "Liverpool resists pressure to make decision on FA Cup". Glasgow Herald. 19 April 1989. p. 2. ^ a b "Soccer rivals united in grief as church bells toll". New Straits Times. Kuala Lumpur. Reuters. 24 April 1989. Retrieved 9 February 2015. ^ "Thousands unite in grief at cathedral". Glasgow Herald. 17 April 1989. p. 1. ^ "MPs urge Hurd to introduce safety gates into 'killer cages'". Glasgow Herald. 17 April 1989. p. 9. ^ a b "Head of UEFA must quit says club". Glasgow Herald. 18 April 1989. p. 7. ^ "Liverpool FC's Top Five FA Cup Finals". live4liverpool.com. Retrieved 26 April 2016. ^ Cowley, Jason (29 March 2009). "The night football was reborn". The Guardian. London. ^ "Feature: It's Up For Grabs Now – The 20th Anniversary Of Anfield 1989". Goal.com. Retrieved 26 April 2016. ^ "A random sample of letters from public, schools and clubs reflecting the nature of donations to the disaster appeal fund". Hillsborough Independent Panel. Retrieved 19 September 2012. ^ Charity fund-raising and the public interest: an Anglo-American legal perspective. Avebury. 1990. p. 127. ISBN 9781856280167. ^ "College course developed with funds from the Hillsborough Disaster Appeal Fund goes from strength to strength". RCS. Retrieved 17 September 2012. ^ "The Official Charts Company – Ferry Cross The Mersey by Gerry Marsden, Paul McCartney, Holly Johnson, The Christians and Stock Aitken Waterman Search". The Official Charts Company. 6 May 2013. ^ Davis, Sharon (6 January 2012). 80s Chart-Toppers: Every Chart-Topper Tells a Story. Mainstream Publishing. p. 501. ISBN 9781780574110. ^ du Noyer, Paul (2007). "Subversive Dreamers: Liverpool Songwriting from the Beatles to the Zutons Paul du Noyer". In Murphy, Michael; Rees-Jones, Deryn (eds.). Writing Liverpool: Essays and Interviews. Liverpool University Press. p. 251. ISBN 9781846310744. ^ "Those who were left behind". The Guardian. London. 8 May 1999. ^ a b "Hillsborough 96". Liverpooldailypost.co.uk. 15 April 2009. Archived from the original on 27 September 2011. Retrieved 7 May 2011. ^ "Hillsborough timeline". The Daily Telegraph. London. 14 April 2009. Retrieved 17 September 2012. ^ "Hillsborough: Brian Reade on the day that changed football forever". Daily Mirror. UK. 14 April 2009. Retrieved 7 September 2009. ^ Johnson, Mark. "Mum pays tribute to teenage Hillsborough victim Lee Nicol from Smollett Street Bootle". Bootle Times. Retrieved 7 May 2011. ^ Brace, Matthew (26 March 1997). "Hillsborough survivor 'awakes'". The Independent. London. Retrieved 7 May 2011. ^ Kelly, Jo (15 April 2009). "Steven Brown, 25 – Hillsborough 96 – Hillsborough Remembered". Liverpool Daily Post. Retrieved 26 November 2011. ^ Traynor, Luke (15 April 2009). "Peter Thompson, 30 – Hillsborough 96 – Hillsborough Remembered". Liverpool Daily Post. Retrieved 26 November 2011. ^ Taylor, Louise (10 April 2009). "Steven Gerrard says death of his cousin at Hillsborough was biggest inspiration". The Guardian. London. Retrieved 15 April 2011. ^ "Hillsborough's '97th victim' remembered". The Bolton News. 28 April 2016. ^ "Hillsborough inquests: The 96 who died". BBC News. 28 March 2014. ^ Conn, David (13 April 2009). "Hillsborough: how stories of disaster police were altered". The Guardian. London. ^ Shennan, Paddy (26 April 2016). "Timeline of a 27 year fight for the truth after the Hillsborough disaster". Liverpool Echo. ^ "Judgement of Divisional Court, 5 November 1993 application to quash the Inquest verdicts of six of the Hillsborough victims | Hillsborough Independent Panel". Hillsborough.independent.gov.uk. 5 November 1993. Retrieved 15 April 2014. ^ a b "'The patronising disposition of unaccountable power' : A report to ensure the pain and suffering of the Hillsborough families is not repeated" (PDF). Assets.publishing.service.gov.uk. Retrieved 14 February 2019. ^ Barlow, Eleanor (27 April 2016). "Two doctors who criticised Hillsborough ambulance response speak of "vindication" after inquests". Liverpool Echo. Retrieved 5 May 2018. ^ Barlow, Eleanor (27 April 2016). "The two doctors who criticised the Hillsborough ambulance response". Liverpool Echo. ^ Taylor, Lord Justice (August 1989). "Hillsborough Stadium Disaster Inquiry – Interim Report" (PDF). Archived from the original (PDF) on 19 June 2013. Retrieved 18 September 2012. ^ a b c d Taylor (1989), p. 49. ^ Taylor (1989), p. 52. ^ a b Taylor (1989), p. 36. ^ Taylor (1989), p. 47. ^ Taylor (1989), p. 40. ^ Taylor (1989), p. 23. ^ Taylor (1989), p. 32. ^ Taylor (1989), p. 24. ^ Taylor (1989), p. 44. ^ Taylor (1989), p. 46. ^ Taylor (1989), p. 53. ^ Taylor (1989), p. 50. ^ "A hard lesson to learn". London: BBC News. 15 April 1999. Retrieved 4 August 2007. ^ "The Architects Journal:Building Study (September 1993)". Millwall-history.co.uk. Retrieved 7 May 2011. ^ a b c d "The Stuart Smith Scrutiny – Hillsborough Football Disaster". Contrast.org. Retrieved 14 September 2012. ^ Stuart-Smith, Murray. Scrutiny of Evidence Relating to the Hillsborough Football Stadium Disaster London, The Stationery Office, 1998. ^ a b "8 May 1998 : Column 941". Parliament of the United Kingdom. Retrieved 15 September 2012. ^ a b "Hillsborough inquiry by Blair government criticised". BBC News. 25 October 2011. ^ "Hillsborough Independent Panel". Hillsborough Independent Panel: Disclosed Material and Report. 2012. Retrieved 27 April 2016. Over 450,000 pages reviewed – Documents and other material from the contributing organisations including reports, minutes of meetings, transcripts, witness statements, letters and memos, records of telephone calls. ^ "Organisations and people whose material has been reviewed". Hillsborough Independent Panel: Disclosed Material and Report. 2012. Retrieved 27 April 2016. ^ Conn, David (12 September 2012). "Hillsborough panel set to publish report on 1989 disaster". The Guardian. London. Retrieved 27 April 2016. ^ a b "Parliamentary business". Parliament of the United Kingdom. 15 December 2009. ^ "Hillsborough files may be opened". London: BBC News. 19 April 2009. Retrieved 19 April 2009. ^ "Who are the members of the Hillsborough Independent Panel?". Liverpool Echo. 12 September 2012. ^ "Page 14 – Hillsborough Independent Panel". Hillsborough Independent Panel Report. Retrieved 19 January 2013. ^ Gibson, Owen; Conn, David (13 September 2012). "Hillsborough disaster: new inquest likely after damning report". The Guardian. Retrieved 22 March 2013. ^ Tozer, James (14 September 2012). "41 could have survived stadium crush". The Advertiser. p. 36. ^ Siddique, Haroon (12 September 2012). "Hillsborough disaster report published". The Guardian. London. ^ Hillsborough: The Report of the Hillsborough Independent Panel, pages 350–352. ^ "Page 4 | Home Office". Hillsborough.independent.gov.uk. 15 April 1989. Retrieved 15 April 2014. ^ "Hillsborough Disaster Report Published – Wednesday 12 September". The Guardian. 12 September 2012. Retrieved 8 March 2017. ^ "Hillsborough papers: Cameron apology over "double injustice"". BBC News. 12 September 2012. Retrieved 12 September 2012. ^ "Hillsborough statement: Cameron and Miliband apologise". BBC Democracy Live. BBC. 12 September 2012. Retrieved 12 September 2012. ^ a b "Kelvin MacKenzie offers 'profuse apologies' over Hillsborough". ITV.com. 12 September 2012. Retrieved 12 September 2012. ^ Press Association (17 September 2012). "Hillsborough families demand new inquests be held". The Guardian. Retrieved 5 October 2012. ^ Gibson, Owen; Conn, David (13 September 2012). "New Hillsborough inquest likely after damning report". The Guardian. Retrieved 5 October 2012. ^ Press Association (13 September 2012). "Hillsborough families call for FA apology over disaster". The Guardian. Retrieved 5 October 2012. ^ Conn, David (19 September 2012). "Hillsborough report: FA could face charges, lawyers tell Liverpool fans' families". The Guardian. Retrieved 5 October 2012. ^ Conn, David (19 September 2012). "Hillsborough families call for Sheffield Wednesday manslaughter inquiry". The Guardian. Retrieved 5 October 2012. ^ Gibson, Owen (13 September 2012). "Hillsborough: Sheffield Wednesday and police urged to admit blame". The Guardian. Retrieved 5 October 2012. ^ Conn, David (19 September 2012). "Premier League chairman must resign, says Hillsborough support group". The Guardian. Retrieved 5 October 2012. ^ Press Association (17 September 2012). "Hillsborough: home secretary says law-breakers must face investigation". The Guardian. Retrieved 5 October 2012. ^ a b Eagle, Maria. "22 Oct 2012 : Column 765". Hansard. UK Parliament. Retrieved 24 October 2012. ^ Dodd, Vikram (24 October 2012). "Hillsborough: Norman Bettison resigns from West Yorkshire police". The Guardian. Retrieved 24 October 2012. ^ Conn, David (24 October 2012). "Hillsborough: police chief 'boasted' of role in smearing fans". The Guardian. Retrieved 24 October 2012. ^ Holehouse, Matthew (13 September 2012). "Hillsborough: Football fans' behaviour made police's job harder, says Sir Norman Bettison". The Daily Telegraph. Retrieved 29 April 2016. ^ "Bettison due £83k-a-year pension despite Hillsborough probe". BBC News. 25 October 2012. Retrieved 25 October 2012. ^ Eagle, Maria. "22 Oct 2012 : Column 735". Hansard. UK Parliament. Retrieved 24 October 2012. ^ "BAILII". Retrieved 12 November 2015. ^ "Hillsborough Inquests". Retrieved 12 November 2015. ^ "Hillsborough inquests: Jury reaches decision on unlawful killing question". BBC News. Retrieved 25 April 2016. ^ "Hillsborough disaster: Fans unlawfully killed". BBC News. Retrieved 26 April 2016. ^ "Hillsborough inquest verdicts quashed by High Court". BBC News. 19 December 2012. Retrieved 22 December 2012. ^ Siddle, John (26 April 2016). "Margaret Aspinall: I am so grateful to the people of Liverpool". Liverpool Echo. Retrieved 27 April 2016. ^ Kirkby, Dean (26 April 2016). "Tears of joy as inquest jury exonerates the 96 Hillsborough victims". The Independent. Retrieved 27 April 2016. ^ "Hillsborough inquests: Reaction to unlawful killing conclusion". BBC News. Retrieved 27 April 2016. ^ "Hillsborough – Statement". Hansard volume 608. UK Parliament. 27 April 2016. pp. Column 1433. Retrieved 7 May 2018. ^ a b Morris, Nigel (26 April 2016). "Hillsborough inquest suggests police 'should be prosecuted'". The Independent. Retrieved 27 April 2016. ^ Taylor, Joshua (26 April 2016). "Calls for prosecutions after 'greatest miscarriage of justice of our times'". Liverpool Echo. Retrieved 27 April 2016. ^ "Labour Party: 'Greatest miscarriage of justice of our times'". ITV News. 26 April 2016. Retrieved 27 April 2016. ^ Prince, Rosa (13 September 2012). "Jack Straw expresses regret over failure of Hillsborough review". The Telegraph. ^ Taylor, Joshua (29 April 2016). "Jack Straw on 1997 Hillsborough inquiry: 'I wish I could turn the clock back'". Liverpool Echo. ^ Taylor, Joshua (27 April 2016). "Kelvin MacKenzie is still blaming other people for S*n's shameful front page". Liverpool Echo. Retrieved 27 April 2016. ^ Taylor, Joshua (26 April 2016). "Watch ex-S*n editor Kelvin MacKenzie squirm as he's chased by cameraman". Liverpool Echo. Retrieved 27 April 2016. ^ Conn, David (17 December 2014). "Freemason police officers tried to 'shift blame' after Hillsborough disaster, inquest told". The Guardian. Retrieved 2 June 2016. ^ Barlow, Eleanor (17 November 2014). "Hillsborough: David Duckenfield was in same Masons lodge as officer he replaced". Liverpool Echo. Retrieved 2 June 2016. ^ Nagesh, Ashitha (26 April 2016). "Hillsborough tragedy: Did the Freemasons influence the Police?". Metro. Retrieved 2 June 2016. ^ Pilling, Kim (26 April 2016). "Did Freemasons influence police over Hillsborough?". The Scotsman. Johnston Press. Retrieved 2 June 2016. ^ Penrose, Justin (13 October 2013). "Hillsborough: Freemason cops banned from working on criminal probe into cover-up". ^ Kay, Dan (4 January 2016). "Freemasons barred from investigation into alleged Hillsborough 'cover-up'". Liverpool Echo. Retrieved 2 June 2016. ^ Crowcroft, Orlando (8 January 2016). "Hillsborough disaster: Why have freemasons been banned from the 1989 tragedy 'cover up' probe?". International Business Times UK. Retrieved 2 June 2016. ^ Laville, Sandra (14 September 2012). "South Yorkshire police to ask IPCC to investigate Hillsborough officers' conduct". The Guardian. Retrieved 5 October 2012. ^ "Justice for Hillsborough Victims and Families: What Happens Next?". International Business Times. 12 September 2012. Retrieved 9 March 2017. ^ Press Association (19 September 2012). "West Yorkshire Chief Constable referred to IPCC". The Guardian. Retrieved 5 October 2012. ^ Conn, David (5 October 2012). "Hillsborough disaster: Bettison's role revealed". The Guardian. Retrieved 5 October 2012. ^ Laville, Sarah (4 October 2012). "Hillsborough tragedy: Norman Bettison to retire after controversy over role". The Guardian. Retrieved 5 October 2012. ^ Gibson, Owen (12 October 2012). "Hillsborough disaster: the new evidence under IPCC investigation". The Guardian. Retrieved 2 May 2013. ^ Gibson, Owen (12 October 2012). "Hillsborough disaster: watchdog to launch biggest ever inquiry into police". The Guardian. Retrieved 12 October 2012. ^ Conn, David (12 October 2012). "IPCC Hillsborough inquiry is another vindication for families". The Guardian. Retrieved 12 October 2012. ^ "Hillsborough probe 'to be UK's biggest into police conduct'". BBC News. 12 October 2012. Retrieved 12 October 2012. ^ "Hillsborough: 1,444 police names passed to IPCC". BBC News. 22 October 2012. Retrieved 24 October 2012. ^ "Hillsborough: Application for new inquests". BBC News. 16 October 2012. Retrieved 16 October 2012. ^ "Hillsborough Investigation Update: Independent Police Complaints Commission" (PDF). ipcc.gov.uk. 11 July 2013. Retrieved 11 March 2017. ^ "Hillsborough: 19 people refuse to help IPCC inquiry". The Guardian. Press Association. 2 June 2016. Retrieved 5 March 2017. ^ "Hillsborough probe finds more police statements changed". BBC News. 12 July 2013. ^ "Statements from the CPS, IPCC and Operation Resolve following Hillsborough inquests verdict". Crown Prosecution Service. Retrieved 26 April 2016. ^ "Straw backs Hillsborough officer". BBC News. 6 November 1998. Retrieved 11 September 2006. ^ "Hillsborough police 'blamed fans'". BBC News. 13 June 2000. Retrieved 11 September 2006. ^ "Hillsborough jury discharged". BBC News. 24 July 2000. Retrieved 11 September 2006. ^ Doyle, Mario Ledwith, Jack, (19 December 2012). "Fresh hopes for prosecutions over Hillsborough Disaster as police launch new investigation and High Court quashes accidental death inquest verdicts on 96 fans". Daily Mail. Retrieved 22 December 2012. ^ "New Hillsborough Investigation Boss Appointed". BBC News. 5 December 2016. Retrieved 11 March 2017. ^ "David Duckenfield faces 95 Hillsborough manslaughter charges". BBC News Online. Retrieved 28 June 2017. ^ Independent Police Complaints Commission [@IPCCNews] (28 June 2017). "(untitled)" (Tweet). Retrieved 29 June 2017 – via Twitter. ^ "Hillsborough disaster accused appear in court". BBC News Online. Retrieved 9 August 2017. ^ "Hillsborough match commander David Duckenfield can face trial". Sky News. Retrieved 29 June 2018. ^ "Hillsborough officer not charged over horse burn claims". BBC News Online. Retrieved 15 December 2017. ^ "Hillsborough charges against Sir Norman Bettison dropped". BBC News Online. Retrieved 21 August 2018. ^ "Hillsborough match commander David Duckenfield denies manslaughter". BBC News Online. Retrieved 10 September 2018. ^ "Hillsborough match commander David Duckenfield appears in court at start of manslaughter trial". ITV News. Retrieved 14 January 2019. ^ "Hillsborough trial: David Duckenfield 'will not testify'". BBC News Online. Retrieved 13 March 2019. ^ "Hillsborough trial: No verdict over David Duckenfield". BBC News Online. Retrieved 3 April 2019. ^ Halliday, Josh; Bowcott, Owen (28 April 2016). "Hillsborough families to sue police for 'abuse on industrial scale'". The Guardian. London. Retrieved 28 April 2016. ^ "Hillsborough memorial clock unveiled at Liverpool Town Hall". Liverpool Echo. 29 April 2013. Retrieved 5 May 2018. ^ Davies, Helen (5 February 2015). "Everton FC to unveil tribute to Hillsborough 96 ahead of Merseyside derby". Liverpool Echo. ^ "Uefa to help Liverpool Avoid Hillsborough Clash". The Guardian. 18 February 2009. Retrieved 11 March 2017. ^ "Hillsborough 10 Years On". BBC. ^ "South African Reds to Hold Memorial". liverpoolfc.tv. Retrieved 12 March 2017. ^ Staff, FA (21 March 2014). "Football to remember Hillsborough disaster". The FA. UK. Retrieved 12 April 2014. ^ Jury, Lousie (11 April 1999). "A minute's silence to remember Hillsborough". The Independent. UK. Retrieved 15 April 2009. ^ "Plea for Hillsborough justice". London: BBC News. 15 April 1999. Retrieved 15 April 2009. ^ "Liverpool avoid Hillsborough anniversary clash". The Independent. London. Reuters. 20 March 2009. Retrieved 2 April 2010. ^ "Reds united in demanding justice". ESPN Star. 16 April 2009. Archived from the original on 21 July 2011. Retrieved 7 May 2011. ^ "Thousands flock to Anfield as Liverpool marks 20th anniversary of Hillsborough". Liverpool Echo. 15 April 2009. Retrieved 15 April 2009. ^ "Hundreds mark Hillsborough anniversary in city". Nottingham Post. 15 April 2009. Retrieved 15 April 2009. ^ "Sheffield's Hillsborough tribute". London: BBC News. 15 April 2009. Retrieved 15 April 2009. ^ White, Jim (15 April 2009). "Liverpool fans turn on Andy Burnham". The Daily Telegraph. London. Retrieved 15 April 2009. ^ "Fans remember Hillsborough". BBC News. 15 April 2009. Retrieved 15 April 2009. ^ "Southport.TV". Southport.TV. Retrieved 7 May 2011. ^ "Hillsborough tribute CD released". London: BBC News. 22 March 2009. Retrieved 19 April 2009. ^ "Kenny's king as Legends triumph". Liverpool Echo. 15 May 2009. Retrieved 21 May 2009. ^ "Match marks Hillsborough tragedy". London: BBC Sport. 15 May 2009. Retrieved 21 May 2009. ^ "Soccer Resumes, Sadly". The New York Times. 23 April 1989. Retrieved 29 December 2008. ^ "Milan vs Real Madrid". Retrieved 4 April 2014. ^ Lacey, David (17 April 1999). "Giggs showed that even in a cash-conscious age the game has moments which defy evaluation". The Guardian. UK. Retrieved 29 December 2008. ^ "Milan vs Real Madrid – Fans Sing You'll Never Walk Alone". Retrieved 11 August 2008. ^ "We've Met (Bradford) Before". Redimps.co.uk. Archived from the original on 26 February 2009. Retrieved 26 November 2011. ^ "1989-04-30: Celtic 0–4 Liverpool, Hillsborough Memorial Match". ^ "MP's tearful tribute to Hillsborough 96". BBC News. 17 October 2011. Retrieved 26 November 2011. ^ "Hillsborough debate full transcript: Read everything MPs said in the House of Commons – link to full video now added". Liverpool Echo. Retrieved 26 November 2011. ^ a b c Scraton, Phil (13 May 2011). Hillsborough – The Truth. Mainstream Publishing. pp. 116–118. ISBN 978-1-78057-041-9. ^ a b MacKenzie, Kelvin (29 September 2012). "Hillsborough and me". The Spectator. Retrieved 30 April 2016. ^ a b c "Chapter 12: Behind the headlines: the origins, promotion and reproduction of unsubstantiated allegations". The Truth (Report). Hillsborough Independent: Panel Disclosed Material and Report. p. 3. Retrieved 30 April 2016. ^ "Police attack 'vile' fans". London Evening Standard: 1. 18 April 1989. ^ a b "The Immediate Aftermath – The Media Reaction – Hillsborough Football Disaster". Contrast.org. Retrieved 26 November 2011. ^ Herbert, Ian (28 September 2012). "Is it time to forgive and forget Kelvin Mackenzie and the Sun over the lies they told about Hillsborough?". The Independent. Retrieved 26 April 2016. ^ Scraton (1999), p. 118. ^ "Original 'copy' of Hillsborough story filed by White's news agency" (PDF). News International. Hillsborough Independent Panel: Disclosed Material and Report. 18 April 1989. Retrieved 2 May 2016. ^ "Hillsborough Inquests: 'Regrets' over pickpocketing claims". Liverpool: BBC News. 10 October 2014. Retrieved 1 May 2016. ^ Gibson, Owen; Carter, Helen (18 April 2009). "Hillsborough: 20 years on, Liverpool has still not forgiven the newspaper it calls 'The Scum'". The Guardian. London. Retrieved 26 November 2011. ^ "Hillsborough report: Prime Minister David Cameron's statement in full". The Telegraph. London. 12 September 2012. Retrieved 12 September 2012. ^ "Police Accuse Drunken Fans" (PDF). Daily Express. London: Northern & Shell. 19 April 1989. Retrieved 12 September 2012. ^ Gibson, Owen (7 July 2004). "What the Sun said 15 years ago". The Guardian. London. Retrieved 26 November 2011. ^ "Witness: Boycott of The Sun newspaper". BBC. Retrieved 26 November 2011. ^ Conn, David (26 April 2016). "How the Sun's 'truth' about Hillsborough unravelled". The Guardian. Retrieved 29 April 2016. ^ Chippendale, Peter; Horrie, Chris (1990). Stick it up your Punter!. Heinemann. ISBN 0 434 12624 1. ^ Gibson, Owen; Carter, Helen (17 April 2009). "Hillsborough: 20 years on, Liverpool has still not forgiven the newspaper it calls 'The Scum'". The Guardian. ^ Greenslade, Roy (29 October 2006). "Why is The Sun cutting its price". The Guardian. London. Retrieved 25 March 2010. ^ Gibson, Owen (7 July 2004). "What the Sun said 15 years ago". The Guardian. Retrieved 26 April 2016. ^ Lister, Sam. "Ex-Sun editor: I was right on Hillsborough". Liverpool Daily Post. Liverpool Daily Post and Echo. Archived from the original on 4 December 2006. Retrieved 1 December 2006. ^ Conlan, Tara (12 January 2007). "MacKenzie speaks out on Hillsborough comments". The Guardian. UK. Retrieved 25 March 2010. ^ "The Sun has lost the plot again". The Liverpool Echo. 7 July 2004. Retrieved 26 April 2016. ^ "News International chairman James Murdoch apologises to Liverpool over Sun's coverage of Hillsborough tragedy". The Daily Telegraph. London. 10 November 2011. Retrieved 26 November 2011. ^ "Hillsborough files: Reaction to release of government papers". BBC News. 13 September 2012. Retrieved 26 April 2016. ^ "Hillsborough: Kelvin MacKenzie offers 'profuse apologies to the people of Liverpool'". The Daily Telegraph. London. 12 September 2012. Retrieved 14 September 2012. ^ a b Allegretti, Aubrey; Harris, Sarah Ann (26 April 2016). "Not Even The Sun Could Have Expected This Level of Anger After Hillsborough Inquest". The Huffington Post. Retrieved 27 April 2016. ^ Burrell, Ian (8 July 2004). "An own goal? Rooney caught in crossfire between 'The Sun' and an unforgiving city". The Independent. London. Retrieved 6 March 2007. ^ a b c Sommers, Jack (27 April 2016). "The Sun Relegates Hillsborough To Page 8, Outrage Ensues". The Huffington Post. Retrieved 27 April 2016. ^ Association, Press (27 April 2016). "Sun and Times front pages criticised for ignoring Hillsborough verdict". The Guardian. Retrieved 30 April 2016. ^ Macdonald, Neil (27 April 2016). "S*n and Times slammed for ignoring Hillsborough on front pages". Liverpool Echo. Retrieved 30 April 2016. ^ a b "Hillsborough: Times admits front page 'mistake'". BBC News. 27 April 2016. Retrieved 30 April 2016. ^ York, Chris (26 April 2016). "The Hillsborough Verdict Shows People Still Haven't Forgiven The Sun Even After 27 Years". The Huffington Post. Retrieved 27 April 2016. ^ Taylor, Joshua (26 April 2016). "The S*n hides behind wall of silence after landmark Hillsborough verdicts". Liverpool Echo. Retrieved 30 April 2016. ^ "Liverpool FC ban for Sun journalists over Hillsborough". BBC News. 10 February 2017. Retrieved 11 February 2017. ^ a b c Martinson, Jane (27 April 2016). "Times front page omitting Hillsborough changed after staff revolt". The Guardian. Retrieved 27 April 2016. ^ @TheTimes (27 April 2016). "We've been criticised today for not having Hillsborough on our first edition front page. This is our response" (Tweet). Retrieved 27 April 2016 – via Twitter. ^ "Hillsborough inquest verdict: the front pages". The Guardian. 27 April 2016. Retrieved 27 April 2016. ^ Lineker, Gary [@GaryLineker] (27 April 2016). "As disgusting as it is unsurprising. They have no shame" (Tweet). Retrieved 27 April 2016 – via Twitter. ^ Walsh, David [@DavidWalshST] (27 April 2016). "I live in a part of England that receives first edition of The Times. Failure to put Hillsborough on front page a shocking misjudgement" (Tweet). Retrieved 27 April 2016 – via Twitter. ^ a b "FHM Australia, pulled after Hillsborough comments". Brand Republic. 22 October 2002. Retrieved 7 May 2011. ^ a b c "FHM faces a boycott after Hillsborough 'joke'". Press Gazette. 25 October 2002. Archived from the original on 16 June 2011. Retrieved 7 May 2011. ^ Byrne, Ciar (28 October 2002). "FHM bungles Hillsborough apology". The Guardian. Retrieved 27 April 2016. ^ "Bigley's fate". The Spectator. London: Press Holdings. 16 October 2004. Retrieved 27 April 2016. ^ a b Doré, Louis (26 April 2016). "The truth about that awful Boris Johnson 'quote' on Hillsborough". indy100. Retrieved 29 April 2016. ^ Heffer, Simon (27 July 2012). "Profoundly flawed, but that won't stop Teflon Boris's bid for Dave's job". Daily Mail. Retrieved 29 April 2016. ^ "Hillsborough: Boris Johnson apologises for slurs in 2004 Spectator article". Liverpool Echo. 13 September 2012. Retrieved 27 April 2016. ^ "Hillsborough papers: Boris Johnson apologises over article". BBC News. 13 September 2012. Retrieved 27 April 2016. ^ Fitzsimmons, Caitlin (16 November 2007). "EastEnders attracts 1,000 complaints". The Guardian. UK. Retrieved 18 November 2007. ^ "Club probes Hillsborough 'insult'". London: BBC News. 18 April 2009. Retrieved 19 April 2009. ^ "Apology over Hillsborough claims". BBC News. 28 June 2010. ^ "United fans want to end Hillsborough chants". ESPN. 15 September 2012. ^ "Manchester United fan groups want end to sick chants". BBC Sport. 20 September 2012. ^ Bates, Ken (18 September 2012). "Leeds United v Hull City official matchday programme". Leeds United A.F.C. : 5. ^ Holehouse, Matthew (19 October 2011). "Hillsborough disaster: Sir Oliver Popplewell outrages campaigners with comments". The Daily Telegraph. London. Retrieved 31 October 2012. ^ "Former judge tells Hillsborough families to drop 'conspiracy theories'". The Guardian. London. Press Association. 19 October 2011. Retrieved 2 November 2012. ^ "Hillsborough disaster: Probe into South Yorkshire police email". BBC News. 14 June 2013. ^ Thomas, Joe (26 April 2016). "Hillsborough disaster inquests verdict finds Liverpool fans unlawfully killed". Liverpool Echo. Retrieved 27 April 2016. The jury at the inquests today delivered a set of damning verdicts placing the responsibility for the disaster directly in the hands of the police, ambulance service and structural engineers who worked on the Leppings Lane end. The nine members of the jury panel also declared that fans played no role in the events that caused the crush on the terraces. ^ "Hillsborough inquests: Jury reaches decision on unlawful killing question". BBC News. 26 April 2016. Retrieved 27 April 2016. ^ "South Yorkshire Police chief suspended over Hillsborough". BBC News. Retrieved 27 April 2016. ^ Tran, Mark (17 June 2014). "Civil servant sacked for offensive Wikipedia edits on Hillsborough". The Guardian. London. Retrieved 17 June 2014. ^ "Q&A: Fox's Steven Cohen on the Advertiser Boycott Over His Remarks on Soccer Stadium Deaths". 24 June 2009. Retrieved 25 October 2015. ^ "Steven Cohen Apologizes For Inaccurate Hillsborough Claims". World Soccer Talk. Retrieved 26 April 2016. ^ "Steven Cohen Blames Liverpool Fans For Hillsborough Disaster". World Soccer Talk. 20 April 2009. Retrieved 11 March 2017. ^ "Flashback: The Hillsborough Disaster and the Fall of Steven Cohen". World Soccer Talk. 14 April 2014. Retrieved 11 March 2017. ^ Bartlett, David (17 January 2013). "Hillsborough mum tells of Sir Bernard Ingham's "hurtful" letters". Liverpool Echo. Retrieved 26 April 2013. ^ a b "Bernard Ingham, who called Liverpool fans 'tanked up yobs', still refuses to apologise to Hillsborough families despite inquest findings". The Belfast Telegraph. 26 April 2016. Retrieved 27 April 2016. ^ a b Bagot, Martin (26 April 2016). "Ingham STILL refuses to say sorry for blaming Liverpool fans over Hillsborough". Liverpool Echo. Retrieved 27 April 2016. ^ Belger, Tom (27 April 2016). "Petition to strip Bernard Ingham of his knighthood for blaming fans". Liverpool Echo. Retrieved 27 April 2016. ^ Thomas, Joe (15 March 2018). "Why the people of Liverpool are totally justified in holding Topman to account". Liverpool Echo. Retrieved 16 March 2018. ^ "Hillsborough Drama Shown Again on ITV Tonight at 10:20 pm". itv.com. Retrieved 12 March 2017. ^ "When a game turned into a disaster". The New York Times. 14 April 2014. Retrieved 15 April 2014. ^ Buchholz, Andrew (15 April 2014). "ESPN's Hillsborough documentary can't be aired in the United Kingdom thanks to British laws". Awful Announcing, Bloguin. Retrieved 21 April 2014. ^ "BBC – Hillsborough – Media Centre". BBC. ^ "Speakers – Lance Nielsen". London Screenwriters' Festival. Retrieved 26 April 2016. Nicholson, Carol E., and B. Roebuck. "The investigation of the Hillsborough disaster by the Health and Safety Executive." Safety Science 18.4 (1995): 249–259. Scraton, Phil. "4 Death on the Terraces: The Contexts and Injustices of the 1989 Hillsborough Disaster." Soccer & Society 5.2 (2004): 183–200. —. "Death on the Terraces: The Contexts and Injustices of the 1989 Hillsborough Disaster". In Darby, Paul; Johnes, Martin; Mellor, Gavin (eds.). Soccer and Disaster: International Perspectives. Sport in the Global Society. ISBN 0-7146-8289-6.